It’s perhaps only fitting that the artist behind Norway’s “national painting” of a mountain in Rondane is featured in what will be the last exhibition at the National Gallery in Oslo for a very long time. When the Harald Sohlberg exhibition that opens this weekend closes on January 13, the National Gallery will close as well. The news was not well-received this week, even though politicians and museum leaders promise the much-loved National Gallery will re-open at some time in the future, after the new National Museum currently under construction opens in 2020. The question is when, and the uncertainty has prompted some angry reaction. “I have worked with this issue for 10 years and become exasperated when I hear that this is the conclusion,” architect Frederik Torp, who long fought a permanent closure of the National Gallery, told newspaper Aftenposten. He leads the movement called Redd Nasjonalgalleriet (Save the National Gallery), and he sees no reason why the popular art museum needs to close 18 months before the new museum opens, and then without a firm plan either for its reopening or what it will contain. 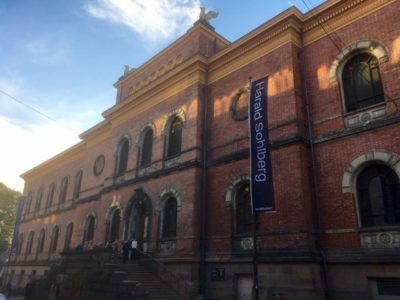 She stressed that the closure is only temporary, and that the National Gallery’s 53,031 works will become a natural part of the new National Museum when it opens on Oslo’s western waterfront between City Hall and Aker Brygge. Work will begin soon, Hindsbo adds, to find a “permanent solution” for the National Gallery, adding that there’s a “good dialogue” going on with the state Ministry of Culture and its government minister Trine Schei Grande. She’s largely responsible for keeping the historic building open and promises it will continue to exhibit art. 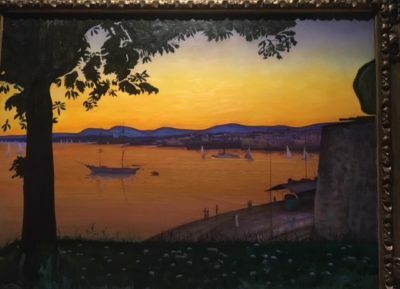 Its final exhibition for the time being features a major collection of around 60 paintings by Harald Sohlberg, some of which have never been shown before. They include Sohlberg’s most famous paintings in addition to many drawings, sketches, prints and even private, decorated letters Sohlberg wrote, to his son, for example. Museum workers worked for years to gather it all from around 30 private owners, Sohlberg’s family and other galleries. Sohlberg, a contemporary of Edvard Munch, excelled with landscapes and the exhibition’s title reflects that: Uendelige landskap (Infinite Landscapes). 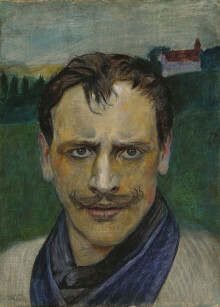 He painted frequently around Oslo, where he was born and later returned to live until his death in 1935. His scenes and subjects remain easily recognizable for those familiar with the area, including the views across the fjord from the Akershus Fortress, from the eastern hills at Nordstrand or the Hurum peninsula west of the city then known as Christiania. Sohlberg also painted in Hadeland north of Oslo and, more famously, in the historic and well-preserved mining town of Røros, southeast of Trondheim. Some of those paintings from 1902 to 1905 are also among Sohlberg’s classics. 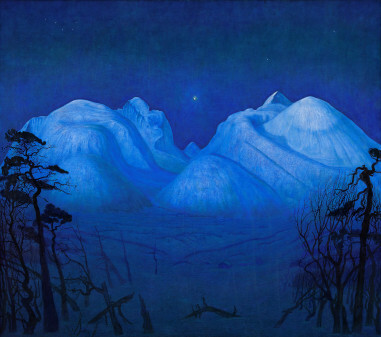 It’s his large painting of Winter Night in the Mountains – Rondane that’s the public’s favourite, though It was selected as “Norway’s national painting” in 1995 through listener voting on state broadcaster NRK. The new exhibition displays no less than 20 versions of the iconic painting, which was inspired by the artist’s Easter ski trip to Rondane in 1899. He worked on it for years, never quite satisfied, but it made a huge sensation when it finally was finished in 1914. The National Gallery bought it exactly 100 years ago, in 1918. 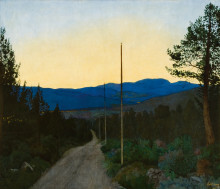 One of them from the private collection of Norwegian philanthropist Christen Sveaas simply depicts a country road heading into the hills, said to symbolize lifetime’s path, while some telegraph poles (new at the time) depicted the future. When the exhibition closes on January 13, the National Gallery itself will enter a period of stillness as well. Sohlberg’s art, however, will travel on to the Dulwich Picture Gallery in London and then to Museum Wiesbaden in Germany. The exhibition’s tour will mark the first time that the art of Harald Sohlberg will be shown so extensively to a European audience.